Students explore budget constraints by solving a contextual problem involving the purchase of goods on a fixed income. Adjustments to the quantities of two goods are used to explore the meaning of points on a graph and relationships between quantities and disposable income. Students scale and label axes as they create graphs of relationships between two goods they want to purchase with a fixed income. Students create a representation of a budget constraint and predict the effects of changes in income and the prices of goods on the representation of the budget constraint. Create a graph representing a budget line and calculate the trade-offs of moving along the line. Represent a budget line using an equation in two variables. Predict transformations of the budget line given changes in income, changes in price of a good, or both. Calculate an equation for a budget line. Explain the meaning of the budget line in terms of personal finance. Bill has $10 dollars to spend on chips and soda. If the price of chips is $1 and the price of a soda is $2, which equation represents the relationship between Bill’s income and the quantity of chips (x) and soda (y) he can purchase with his money? Bill has $10 dollars to spend on chips and soda. 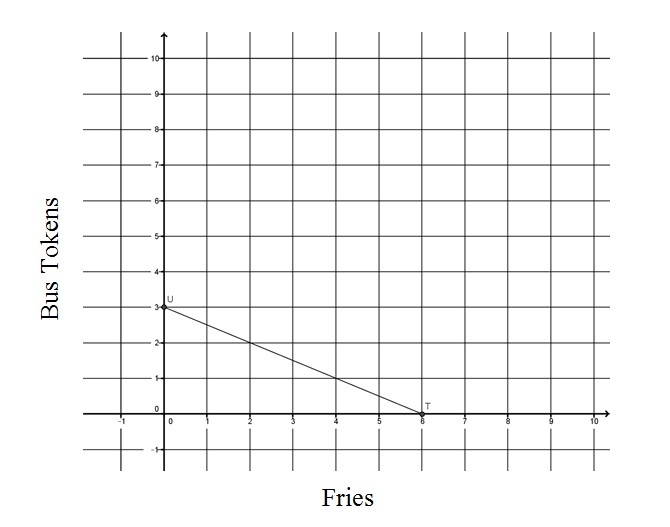 If the price of chips is $1 and the price of a soda is $2, which graph represents the relationship between Bill’s income and the quantity of chips (x) and soda (y) he can purchase with his money? 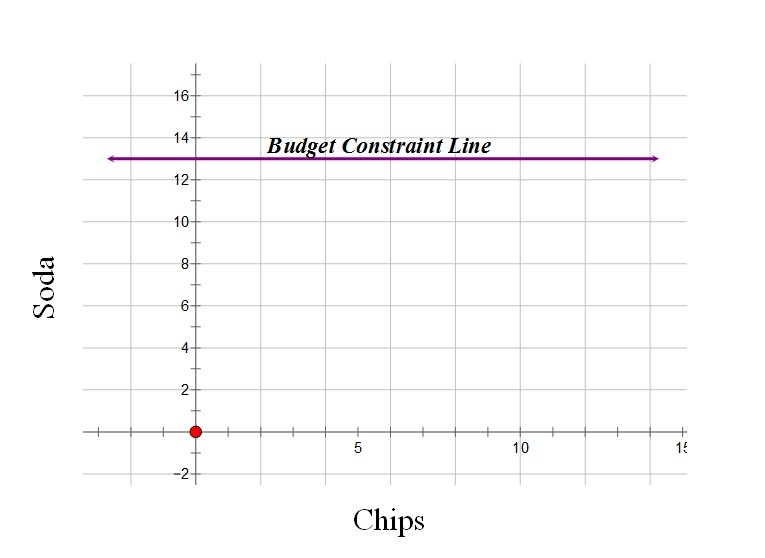 Create a graph of the budget constraint line if Pat’s income is 12 dollars, bus tokens are four dollars, and fries are two dollars. Budgets are an important part of personal finance and meeting financial goals. While a budget is a spending and saving plan, based on estimated income and expenses for an individual or an organization over a specific time period, budget constraints are limits. Goods are tangible objects and services are activities that people perform for us. Both satisfy economic wants. The prices of goods and services and the amount of personal income-(i.e., payments earned by households for selling or renting their productive resources which may include salaries, wages, interest and dividends)-limit spending and serve as constraints to budgets. This lesson considers a problem situation in which only two goods can be purchased with a given income. This simplified approach should enable students to extend the decision-making process to more complex (e.g., real-world) challenges virtually everyone faces. 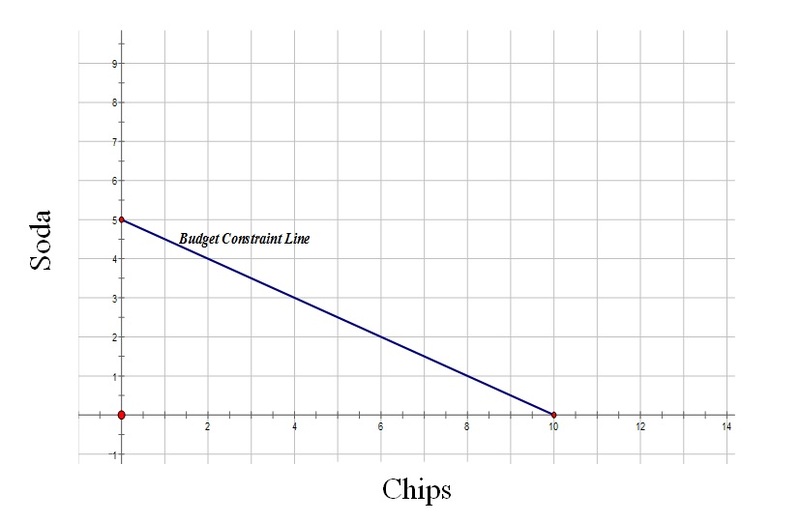 The budget line is represented using tables, graphs, and linear functions. Equations use constants and variables to represent relationships between quantities. Variables are symbols used to represent numbers. The impact of shifts in income and prices of goods can be analyzed by exploring transformations of the budget line that represent relationships between these quantities. Show Slide 1 and tell students they are going to explore the expenses involved in hanging out with friends. Tell the students that they will investigate the expenses involved with “hanging out” in a problem situation designed to model the relationship between income and prices of goods. Show Slide 3. Write the following terms on the board: income, budget, budget constraint, and trade-off. Ask the students to share words that could be used to define each term. List the words the students use on the board. Write the definitions below on the board (or use Slide 4) and circle any of the words used by the students in the definitions. For example, if the students used the term “salaries,” circle the word in the definition of income. Income: Payments earned by households for selling or renting their productive resources. May include salaries, wages, interest, and dividends. Budget: A spending-and-saving plan, based on estimated income and expenses for an individual or an organization, over a specific time period. Budget constraint: All the combinations of goods and services that a consumer may purchase, given current prices, and still be within his or her given income. Tradeoff: Giving up some of one thing to gain some of something else. Show Slide 6. Tell students that Pat rides the bus using the stops in green. Ask students to complete number 1 on Activity 1. Ask students to complete number 2 on Activity 1. Ask students to complete number 3 on Activity 1. Show Slide 10. Ask students what patterns they notice and what they noticed that helped them fill in the table quickly. [Answers will vary. Students may notice constant differences in rows (2) or columns (4). They may also notice diagonal differences are constant (6).] Point out that this table represents the amount Pat would spend on different combinations of fries and tokens. Ask students to answer number 5 a-c on Activity 1. Review answers using the Activity 1 Answer Key. Show Slide 11 to verify student answers. Tell students that now they will find an equation for all of the possible combinations. Show Slide 12. Put students into pairs. Give each pair a copy of Activity 2. Ask students to work with their partner and fill in the table in problem number 1 on Activity 2. Tell students they have now represented all of the possible combinations of fries and tokens Pat can buy with 32 dollars. Tell students this is an example of a budget constraint or all the combinations of goods and services that a consumer may purchase, given current prices, within his or her given income. Show Slide 14. Tell students to work with their partner to complete numbers 2-4 and the table in number 5 on Activity 2. Give the students 10 minutes to finish this task. Review answers using the Activity 2 Answer Key. Tell students they are going to represent Pat’s budget and constraints on that budget with a graph. Ask for volunteers to suggest points you need to plot on the graph. Ask students to plot the points on the graph in number 5 on Activity 2. 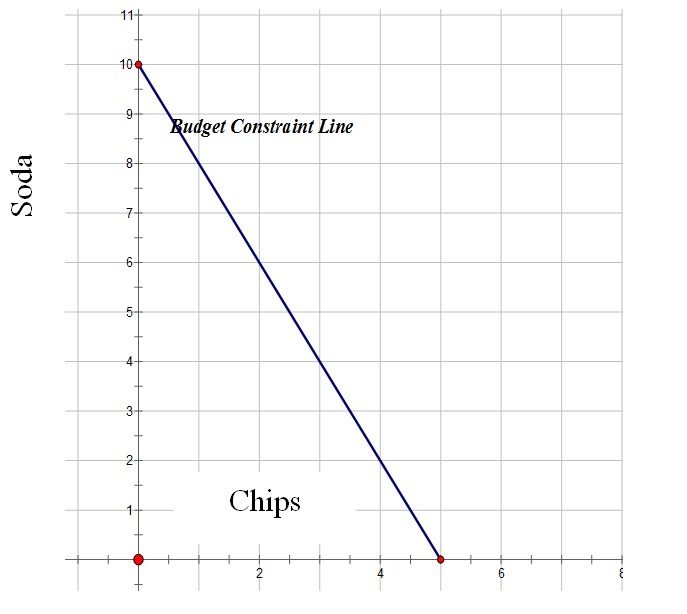 Tell students they can represent the limit of Pat’s budget with a line. 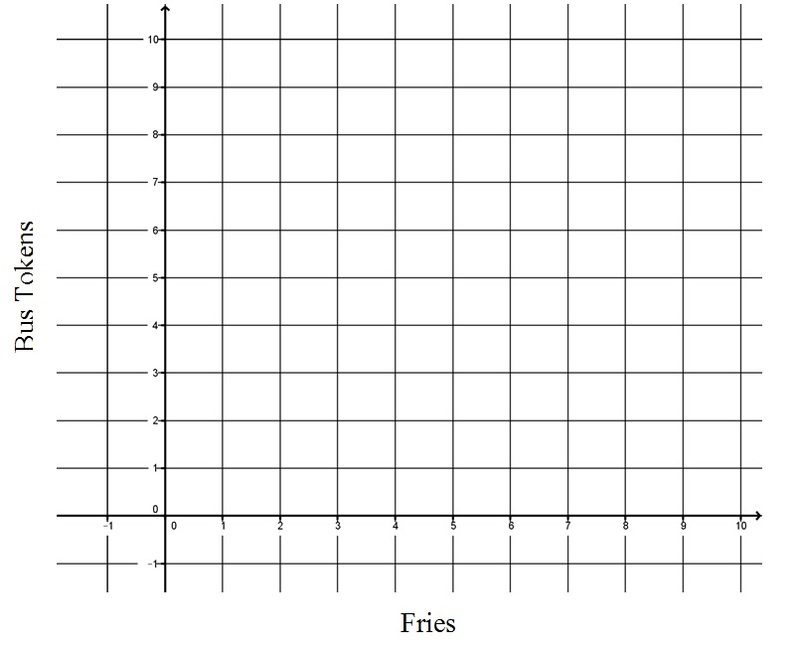 Points below the line represent quantities of fries and tokens Pat can buy. Ask students to draw the budget line in number 6 on Activity 2. Display slide 15 and ask students to check their graph for accuracy. Ask students to complete numbers 7-12 on Activity 2. Give students 10 minutes to complete this work. What is the equation of the line? [Answers will vary, but students should be able to see that the equation of the line is the same as the equation from the table they created namely 1x+2y=32.] 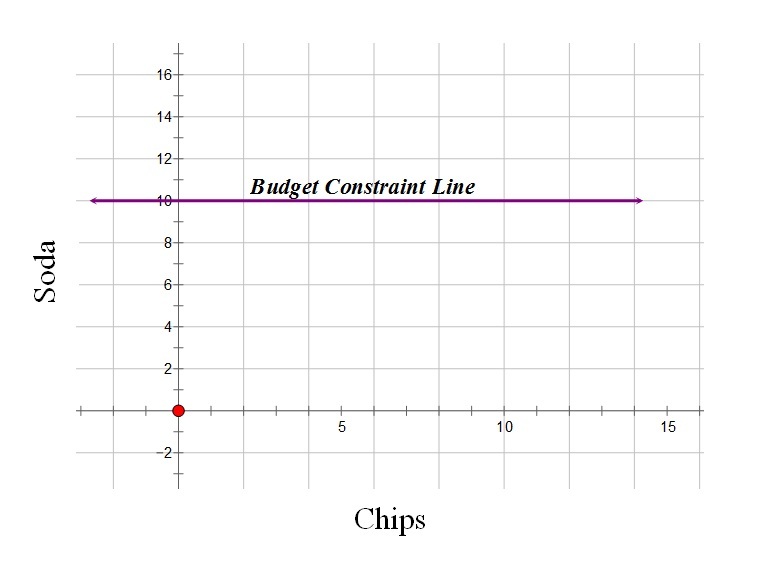 Note that the goal is to build a link between the computations and the graph as a representation of Pat’s budget and its constraints for hang outs. Call the students back together and tell them that Pat just got some news. Show Slide 17. Ask students how this news will impact the budget constraint graph. Ask students to work with their partner to complete number 13 on Activity 2 and to create a new graph to represent the effect of the news. Give the students five minutes for this task. Ask students to complete number 14 on Activity 2.